Everyone knows that when a driver becomes distracted while behind the wheel, he puts other motorists and pedestrians at a serious risk of injury. Yet people keep doing it and Marylanders keep getting hurt and killed. Distracted driving is becoming a major problem in this country. Although a driver may be distracted by almost anything (his own reflection in the rearview mirror, for instance), the distraction these days is most often the result of some form of technology use. Practically everyone has a cell phone, and not everyone uses them responsibly. At any given moment in America, approximately 660,00 drivers are using cell phones or manipulating electronic devices while driving. (National Occupant Protection Use Survey). In-depth accident investigations have shown what Maryland car accident lawyers already knew: nearly half of the human causal factors in accidents are related to perception or attention such as internal distractions, inattention, improper lookout, and so forth. Drivers engaged in some activities, including dialing/texting on the phone, adjusting vehicle controls, and reaching for food or drinks, are less likely to have their hands on the wheel and more likely to have their eyes directed inside the vehicle and away from the roadway. Talking on a phone while driving is the most common type of distracted driving. The research evidence on the distracting effects is nothing short of mindblowing. Estimates of increased risk of a crash with telephone use are somewhere between 4 to 9 times greater. Another study found that distraction and inattention may the primary cause in more than 20 percent of crashes and near-crashes. One study reported a 10-fold increase in drivers failing to stop at a stop sign when on the phone, as compared to those not on the phone. These findings clearly showed the dangers (increased response time and lower compliance) of talking on the phone when approaching a stop light. Another study has reported that based on phone records almost a quarter of motorists in car accidents were on the phone within 10 minutes before the accident. The number of people injured in distracted driving accidents in 2016 was an estimated 421,000 people. Another more compelling way to say it: 8 people die every day in this country from texting and driving. Tragic incidents of texting and driving accidents, especially involving teen drivers, are becoming more and more common. These are often new drivers who are already inexperienced, and that makes their distracted driving even more perilous and potentially fatal. 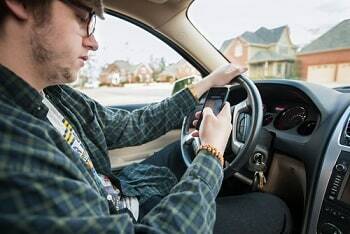 According to the National Highway Traffic Safety Administration (NHTSA), for drivers 15-19 years old involved in fatal crashes, 21% of the drivers were distracted by using a cellphone. It is true that some brief driving distractions are not only acceptable but necessary. Prudent drivers must monitor the surrounding situation, check rear view mirrors, and monitor fuel level and speed. Such monitoring should take no more than 1-2 seconds and good drivers seamlessly handle these routine distractions. But Maryland's road and filled today with a very different type of distracted driver. All of these can cause serious and fatal car accidents. Which Distracted Driving Crashes Put Us All at The Greatest Risk? A driver who is texting or talking on a cell phone runs a red light or stop sign and strikes another vehicle or a pedestrian. Texting kills. A driver is eating his lunch and drinking a large soda while driving swerves into another lane and sideswipes another vehicle. A driver adjusting his GPS navigation or fidgeting with his CD player fails to look up in time and smashes into the rear of the car in front of him. The most common cause distracted driving car accidents is texting and talking on a cell phone. But we see more GPS navigation cases, usually with GPS devices not built into the vehicle. Maryland law expressly prohibits using a handheld phone while operating a motor vehicle. But everyone today is using their iPhones and Androids for navigation because a car navigation system costs thousands of dollars. There is a reason why this is illegal: paying attention to your phone instead of the road causes accidents. Mounted GPS devices are legal in Maryland but must be "placed on the windshield or rear window, within a 7 inch square area in the lower corner, or on the side windows of the vehicle to the rear of the driver, if the materials are placed so as not to interfere with the driver's clear view of traffic." SeeMaryland Code, Transportation, § 21-1104(c)(1). Jenna, a high school senior at Hyattsville in Prince George's County, is having a really bad day. She just found out that her prom date, Brian, has decided to take another girl to prom instead. It didn’t help matters much that Brian’s new date is Jenna’s arch enemy. Jenna can’t wait for school to be finished so she can rush home, cry a bit, and curl up next to the TV with a tub full of ice cream. As the final school bell rings, she heads out the back door into the school parking lot and hops in her brand new pink Jeep. She throws her seatbelt on, checks the rear view mirror as she backs out, and exits the school parking lot. As she waits at the red light to turn onto Main Street and head in the direction of home, she feels her cell phone vibrate in the middle console. She knows she shouldn’t answer it while she is driving, but, hoping its Brian with a heartfelt apology, she reaches for the phone anyway and flips it open to read the text message. While the message was indeed from Brian, it apparently did not contain an apology. Jenna, re-energized with anger, makes an illegal right turn on red and begins punching away at her phone to tell Brian how much she really hates him. Of course, while doing this, Jenna has neither of her eyes on the road. As she pauses to take a break in the text message, she looks up and to her horror, sees that she has crossed the center lane and is driving on the wrong side of the road. She can swerve back onto the right side of the road in time to avoid a head-on collision, but as she attempts to merge back into her original lane of traffic, the side of her vehicle clips a school bus full of children. The school bus driver, Dave, suddenly jerks the wheel to the left, causing the bus to flip on its side. While none of the children were severely injured (miraculously), the bus driver suffers a broken neck sustained when the bus turned on its side. The accident and the bus driver’s injuries are the results of Jenna’s distracted and negligent driving. If Jenna were not distracted by her cell phone, she would not have had to swerve into the school bus, causing it to flip on its side and injure Dave the bus driver. Who Will Write the Check for My Settlement or Verdict? Victims who have been badly hurt in a car crash - any car crash - want to know how much money they might get. We answer this question many ways here, flushing out settlement values in different jurisdictions and with various types of injuries. Distracted driving accidents, including texting, are just like any other crash for insurance purposes. The insurance carrier provides coverage and pays any verdict or settlement (sometimes limited by the policy limits of the vehicle and the driver). Maryland: $928,000 Verdict. Plaintiff, a great woman with four kids and a great husband, was driving to work. The at-fault driver is waiting at a light. She is looking for her parking pass. She heard a beep and, without thinking, pulled on the road and broadsided our client. Her ankle was badly injured. Allstate offered $70,000 to settle out-of-court before a lawsuit. Just before trial, they doubled their offer to $140,000. We still thought it was ridiculous. The jury did too. Maryland: $663,821 Verdict. The plaintiff, a pedestrian, was lawfully crossing an intersection when the defendant driver failed to yield for the pedestrian and struck her at a high rate of speed. The driver later admitted she had been texting at the time of the accident. The plaintiff sustained grave injuries to her left leg and knee, which developed into a patellar tendon injury, requiring multiple surgeries and continuous therapy. State Farm made a tiny offer - less than $30,000. It is fair to say that State Farm thought a Baltimore County jury would not be fair because she really did not have large medical bills. Our law firm thought a jury would understand the depth of her suffering from this very needless pedestrian accident. They did, obviously. Maryland: $167,874 Verdict. The plaintiff was driving in a small sedan when her car was struck by the defendant driver’s pickup truck after he had run a red light. The defendant was talking on his cell phone at the time of the accident. The plaintiff suffered severe scalp lacerations that required eight sutures to close. She also sustained painful soft tissue knee and back injuries that required periodic but continuous treatment. If you have been the victim of distracted driving and have been badly hurt, what you don't need is a distracted lawyer. You need a great lawyer. You need someone who is on your side who will fight back for you. Call 800-553-8082 or get a free case evaluation online. The texting problem: We know it is awful. We know it causes injuries and fatalities. Why do we keep doing it?